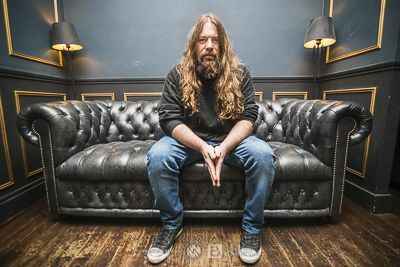 After more than twenty years of loyal service with Lamb Of God, guitarist Mark Morton has decided to release his first solo album. Meeting with this musician who is emblematic of the metal scene! When the guitarist of a legendary thrash metal band releases his first solo album with prestigious guests from around the world, it can only make you want to discover all this with impatience! 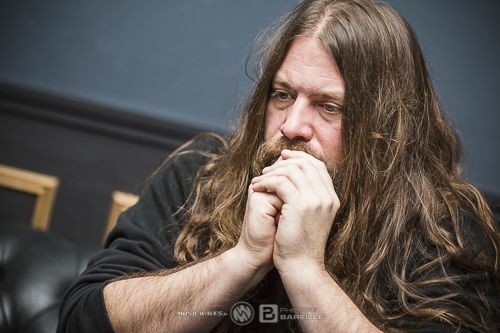 Known to be the guitarist of Lamb Of God since the band's creation, Mark Morton waited until the beginning of the year to release his very first solo album. With about twenty renowned guests along the ten tracks of the album, this opus will undoubtedly be highly anticipated by fans of the American combo! 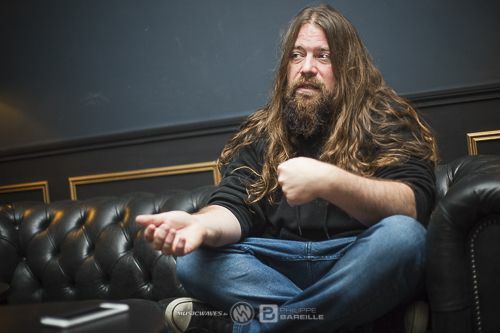 During this interview, Mark Morton went back to the origin of this record for Music Waves. We like to start our interviews on Music Waves with the following question: what is the question you have been asked too often? Mark: Most of them! (Laughs). Some questions are asked very often, but that doesn't mean you shouldn't ask me them. 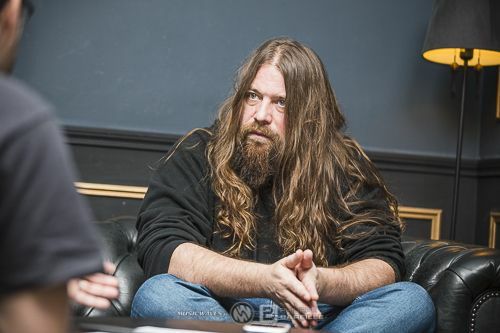 Some of them want to know why I released a solo album with a style different from Lamb Of God, and I think that's a good question, I don't mind being asked it. That's part of the questions I'm commonly asked. It deserves to be asked because I have worked a lot with Lamb Of God. People aren't supposed to know that when I'm not with Lamb Of God, I play other styles of music, and that's why I made a solo album. Finally, I start answering the question myself! I found myself writing a whole bunch of songs that didn't fit into Lamb Of God. The songs existed before having the project to record a solo album. For us, this album is like a child that we are eagerly awaiting, as if you had the need within you to write this album and have a solo career. Are you okay with that? Or was it just that you wrote songs that didn't coincide with the style of Lamb Of God? Mark: Well... For a while, I aspired to do things outside of metal. I didn't consciously decide that I was going to play anything other than metal. I was already writing in that style. I was already playing blues on the guitar. When I'm at home, I don't do headbang on thrash metal! I listen to rap, I listen to The Allman Brothers, I jam while listening to that kind of thing. I love thrash metal. I grew up with that, I'm good at it, so that's what I play on stage with Lamb Of God. That's my thing. This album is more like what I play in my free time. Why didn't you release this solo album earlier, since you've been playing this genre for a long time? Mark: I didn't really have the opportunity to do it. I showed the songs I had written to Josh Wilbur, who has been my producer for a long time. I asked him for his opinion on these songs. I told him that for me it was good and that it should be an album. To carry out a project like this, as you probably know, it requires a lot of resources and investment, and you need to be well surrounded. This is the moment when Jake (Jake Oni, editor's note) started his WPP Records label. Josh and I developed the songs together. It was the realization of these things simultaneously that made "Anesthetic" come out. A few years ago, I published instrumental songs on Soundcloud. So all this came gradually. It's also the best way to avoid pressure, to avoid having a deadline for releasing an album. Mark: It was good not to have a deadline, indeed. It was even necessary for this project because there are so many people involved (about twenty musicians collaborated on this album, editor's note). Josh, my producer, is a handyman. He is constantly working on several projects. I'm almost full-time with Lamb Of God and we have a very busy schedule, so for Josh and I, it was hard to find a time to work together. It was a challenge to bring back all these people who have their own group. Logistically, it was a challenge. It took more than two years to get everyone together. So in reality, I had been working on this project for a while. There are songs I started writing three or four years ago. Do you think this solo album can find its audience? You are known to be the guitarist of Lamb Of God, a very big thrash metal band, but this album is not of this style. Aren't you afraid of the welcome this album will have? Mark: No, I'm not afraid. It's not my job to sell the album. My job is to write it. It is those who will sell the album who could answer this question. I hope it sells! I think so, yes. At the moment, we have released three songs and they have been very well received. There are guests like Chester Bennington and Myles Kennedy. It helps! The reception has been pretty good so far! You say yourself that this album is very far from your universe. Can these songs be well received by Lamb Of God fans? Mark: It doesn't matter to me. I think there will be Lamb Of God fans who will like it and others who will not. It's not a problem! There are probably thrash metal fans who won't understand, but there are plenty of them who will love it. It's a diversified album and it's very good. I'm not the first person to release an album like this. There is the song'Reveal' which has a jazz and soul side and which could remind Amy Winehouse or Aretha Franklin. You can see that we're far from your usual style. Isn't it a shame that these songs don't reach the audience of these styles of music? Mark: That's what I've been playing for years. This is my comfort zone! For me, it's natural. I didn't think I was going to learn to play the soul blues! It came naturally to me. With this album, I make sure that people hear what I play. People only know me as the guitarist of Lamb Of God, but on a personal level, that's the kind of thing I play and I wanted to let people know. For me, it's a pretty harmless approach, even if it won't be the case for some of my fans. I wouldn't want to underestimate Lamb Of God fans and metal fans in general. I think many of our fans have very broad tastes. What impressed us the most was the number of guests on this album. 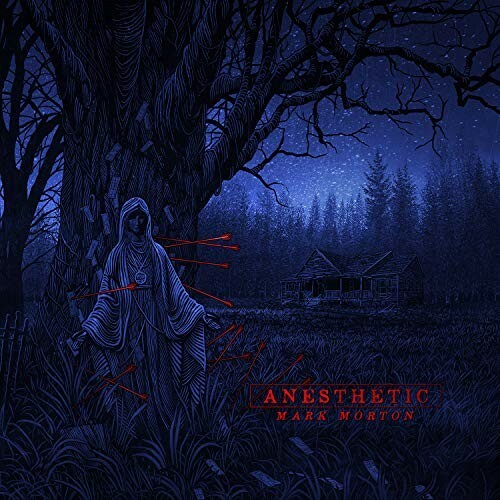 You weren't afraid to lose a certain coherence by bringing together on the same album Alyssa White-Gluz (singer of Arch Enemy), Chester Bennington (late singer of Linkin Park), but also Mark Lanegan (former singer of bands like Mad Season and Queen Of The Stone Age) or Naeemah Maddox? Mark: I guess it wasn't easy for Josh Wilbur in terms of production when he had several singers, different instruments. There is Alex Bent from Trivium who plays the double pedal, Jean-Paul Gaster from Clutch, Steve Gorman from The Black Crowes... Josh did a very good job of making the connection between all this by making it fluid. We wanted the sequence of tracks to be fluid. We didn't want the first half of the album to sound a certain way and the second half to sound different. We wanted it to sound the same. I wrote the songs one after the other. It was the songs themselves that dictated which musicians I needed. I wouldn't have wanted Mark Lanegan to sing on'The Truth Is Dead' or Chester Bennington to sing on'Axis'. The challenge was to find the right singers according to the needs of the song to reveal its full potential. Chester Bennington sings on'Cross Off'. Did you hesitate to release that song after his suicide? Mark: No, I didn't hesitate. I know how much Chester loved that song. I know because I wrote it with him. I know how excited he was when we were working on it, when he recorded his song and got along. For me, the question was not whether people should listen to this song or not. There was a period of time between Chester's death and the release of this song, and that period was probably necessary. I wouldn't have liked it to have appeared right after her death. I wanted to make sure that the timing would be good for Chester's loved ones and it was. I have a feeling we did things right. I think Chester really wanted people to listen to his performance. And its performance is remarkable. He puts all his soul and all his strength on this piece. Beyond the emotions, he proves that he was a very good metal singer. Were you impressed by his performance as well? Do you think he got the recognition he deserved from the media and fans? Mark: I think everyone on this planet agrees that Chester Bennington was one of the most incredible voices in rock music. He's one of the best rock singers in the world. This has been the case since his death, but it was not necessarily the case before. Mark: I don't know. He sang for Stone Temple Pilots and many thought it was a very good idea. Vocally, he did some impressive things. I'm not a journalist, but for me, Chester Bennington was one of the best singers of our generation, and that's why I wanted him to sing on that song. But maybe you're right, maybe people think he's even better since he disappeared. In our opinion, he was in any case underestimated, and thanks to this kind of song, you proved that he was an excellent singer. Mark: Thank you for saying that. I didn't try to prove anything, but I consider myself lucky to have worked with him. Having been in a recording studio with him, I saw his technical abilities, I was able to ask him to change some notes, to change his vibrato, I made some remarks, and he gave immediate satisfaction. He really is in control of his voice. He is one of the best singers of our generation. Mark Lanegan is another very good singer. He sings on'Axis'. This song really has its paws. She highlights her deep and deep voice and her melancholic universe. Did you think about collaborating with Mark when you composed this song? It's a song that reminds us of Nick Cave and Alice In Chains. Mark: I didn't really have Mark in mind when I wrote the first version of this song that has an interesting story. I wrote a first version of this song, sent it to Mark who wrote lyrics and recorded his song. When he sent it back to me and I heard his song, it gave me new ideas. We rewrote a completely different song while keeping the song, and this is the version we hear on'Axis'. That has evolved quite a bit. To some extent, it was very collaborative, because I sent him a song, he recorded his song that was very good, and I changed everything else. Could you have put the initial version as a hidden track or as a B-side? Mark: But that's the beauty of it! We also find the tracks "Sworn Appart", "Save Defiance" and "Back From The Dead" which are more typical of heavy alternative rock, with a very catchy and melodic side, with Jacoby Shaddix, Myles Kennedy and Josh Todd featuring. Again, did you think of them to sing these songs when you wrote them? Would you agree if I told you that these songs sound like songs they would have written with their band? Mark: I take that as a compliment. No, I didn't really have them in mind, the reason is that on these songs, we wrote the instrumental first, always. On'Sworn Appart', I had almost all the lyrics of the song with a demo of the song I had made myself. We listened to that song, and instantly, we heard Jacoby. In many cases, the singers we hear on the record are the ones we had initially thought of, because their voices went well with the songs we had written. As we listened to the instrumental songs, we wondered who could sing them. But what you did with'Axis', modifying the song after having the version sung by one of the guests, didn't you do it again for the other tracks on the album? Mark: No, they stayed the way they were. We didn't really change them. In the case of'Save Defiance' and'Back From The Dead', Myles Kennedy and Josh Todd wrote the lyrics respectively. I sent them the instrumental songs and they wrote the lyrics and song lines. But actually, the songs seem to be their own songs, that's why I appreciate your remark. For'Back From The Dead', we had written a rather shabby rock song and we needed a rock star to sing it. Josh Todd was the perfect choice. On'Save Defiance', I couldn't imagine anyone else but Myles. Before we even offered to sing it, we knew it was a song for him. As for Jacoby, we had written the song and I had written the lyrics. Most of the singing lines came from me, but he took them back. He has real energy in his voice. He gave another dimension to this song. It was perfect for him. There are also more brutal songs like'The Never' and'The Truth Is Dead'. How does it feel to work with a legend like Chuck Billy? Is this a dream come true for you? Mark: Today, Chuck has become a friend. We've toured together many times. It was easy for me to think about him since we are friends. His voice is legendary in thrash metal. As a teenager who grew up in the late 80's and early 90's, I was a big fan of Testament, and today Chuck is a friend and we wrote a song together! This is incredible! For me, the choice to collaborate with him on this title was easy. On 'The Truth Is Dead', we appreciated that you sing Alyssa (White-Gluz, Arch Enemy's singer) with a clear voice, because people often forget that she is a very complete singer. We also find the voice of Randy Blythe (the singer of Lamb Of God) with much more violent interventions. Were you looking for a more death metal type song? The songs on this album are songs that you've been playing on your side for some time, which is not the case with the two songs I just mentioned. Did the idea of putting them on a Lamb Of God album cross your mind? Mark: No, I didn't want to write these songs for Lamb Of God. Because these songs have all the ingredients to be played by Lamb Of God! Mark: I agree. I also play metal by myself, of course! I like metal, but I also like other styles. I was working on these songs on my side, not specifically for Lamb Of God, although I think Lamb Of God could have played them. It would have sounded very good since Randy did a very good job on'The Truth Is Dead'. As for Alissa, I didn't ask her to sing in a clean voice. She made that choice herself, and it was beautiful. I'm glad she sang that way because she has an incredible clear voice and fantastic abilities, and she really shows it on'The Truth Is Dead'. As I was saying, Josh thought it would be nice to incorporate some more traditional thrash metal songs. These two pieces are the result of his suggestion. You sing on the song "Imaginary Days". Why did you make that decision? Mark: It all started quite naturally. I wrote a lot of lyrics on the album. When I write, I use singing as a tool to see if the lyrics work. I also write for Lamb Of God. 'Imaginary Days' is one of the first songs written during this session. I had the lyrics, I had the vocal melodies, so I recorded the song right away, but over time I got used to my singing. It was the same on a few other songs as well. For this song, and like the others, we had planned to call someone to sing it, but we really got used to my version, and we wondered why we wouldn't keep my singing. Is that your original vocals on this song? Mark: No, we re-recorded it. And what do you think of your voice? Did it feel weird to hear it? Mark: No, it didn't sound weird because it's my voice! But in general, it's weird to hear your own voice on a recording when you're not used to it! Didn't you? Mark: In a way yes, but with Lamb Of God, I've already done the choirs. For me, singing is part of the studio process. Do you think this album will change anything about your involvement in Lamb Of God? Now, you've highlighted yourself with this album, you sing. Will it give you more confidence in your role in Lamb Of God? On the artistic level, but also on the human level. Mark: No, I don't think so. I think our roles in Lamb Of God have been established for a long time. I contribute a lot at the artistic level in this group. But with this album, you prove that you are not just a simple contributor but that you could definitely be a leader of a big project like Lamb Of God. Maybe an album like this will give you higher ambitions for the future? 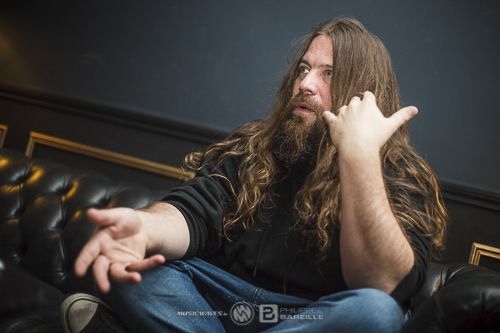 Mark: I'm already very ambitious with Lamb Of God! (Laughs). I contribute creatively. Randy is a real rock star. He has a huge voice and he represents the group very well. He also contributes a lot in terms of lyrics. On my side, I am also very ambitious for Lamb Of God. In a band, the singer often draws all the attention to himself. Often, the singer is also the frontman, and it is he who ensures the promotions for his band. So it is not you who are asked the questions in interviews in general. And what do you expect from this album? Mark: It's a bit cliché but I was very excited to release this album. The songs have potential. I had the opportunity and resources to work with Josh, who is one of my best friends and my favorite producer. And the best part of the work was the opportunity I had to be able to work with all these incredible artists and collaborate with them. I didn't expect that. The three songs we released before the album was released were very well received. Isn't it frustrating for you not to be able to play these songs on stage? Mark: Actually, we're going to play them on our next tour in North America at the end of March. All right, and who's going to sing them? Mark: Mark Morales who sings on'Blur' will be the lead singer on the tour. Maybe you'll sing more in the future? Mark: Who knows! I will continue to sing while composing my songs, but I don't really want to be the lead singer in a band. Can we expect a second solo album from you? Mark: I don't know yet, but if the opportunity presents itself, I'll take it. For my part, I will continue to write songs. We started this interview by asking you what the question you had been asked too often was. On the contrary, what would you like me to ask you? Mark: I don't know, I'm not a journalist! Didn't you come here to make this promotion with specific topics to discuss? Mark: No, honestly. For me, everything is about the music. I communicate the things I have to say in music. If I have something to say, I say it through the lyrics and through the music. That's how I communicate and not by saying, "listen to me, I have something to say!" But it's only up to me! Some of them are good in there, but for me, everything goes through music. So you're in a delicate situation right now? (Laughs). Mark: Oh no! (Laughs). I'm grateful you're here to talk to me about all this!